This Jaguar MKII 3.8 is one of only twenty-five original cars modified by Coombs of Guilford. Having been a successful driver, John Coombs turned entrant for some of the best British drivers of the fifties and sixties, including World Champions Jackie Stewart, Jack Brabham and Graham Hill. The family business, Coombs of Guilford, was one of the foremost Jaguar dealerships so it was no surprise that Coombs successfully entered the British Saloon (Touring) Car Championships with Jaguars. Initially racing the 3.4 litre MKI, then the MKII and finally the MKII 3.8 litre, the battles between the dark blue Sopwith and the white Coombs cars driven by Jack Sears, Mike Parkes, Roy Salvadori and Stirling Moss were the highlights of any race meeting of the time. Unlike their opposition, Coombs received bare shells from Jaguar and built them into race winning cars utilising their own modifications. Some of these engine and chassis tweaks were made available to clients for their road cars. In the early sixties these made an enormous difference to the performance but at a similar increase in price, probably the reason only 25 cars were so modified. 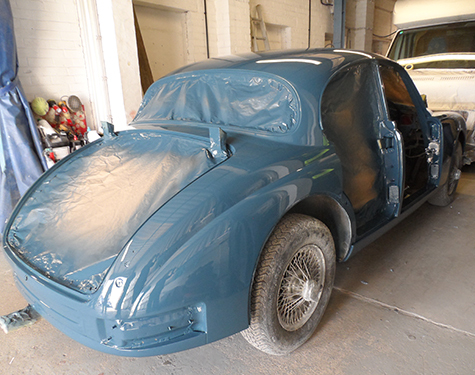 This particular car was brought to us having been sat in another bodyshop for some time. 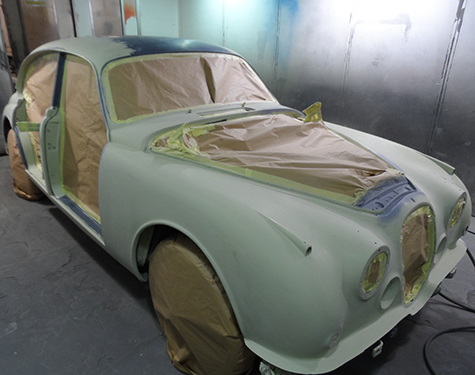 The owner not being happy with the way the car was being restored turned to Proline. Our team had to go through boxes and boxes of parts, paint the car and start to piece it back together. The car was finished over a two-year period to the point it left our workshops driving, with an MOT, ready for the owners distinguished collection.